October 12, 2016, 10:34 AM · British violinist Daniel Hope will help direct the New Century Chamber Orchestra as the orchestra searches for a permanent replacement for Music Director Nadja Salerno-Sonnenberg, who will step down after the current season, the orchestra announced this week. The San Francisco-based New Century Chamber Orchestra has appointed Hope as "Artistic Partner," a role in which he will direct the orchestra from the violin in multiple performances for the next three seasons, beginning with the 2017-2018 season. Daniel Hope. Photo by Harald Hoffmann. Salerno-Sonnenberg has been Music director of the ensemble since 2008 and is credited with transforming the conductorless ensemble with her fiery musicianship, devotion to new music, outreach to the community, and tours going beyond it. Hope debuted with New Century last February as Guest Concertmaster in a well-received concert celebrating his late mentor, Yehudi Menuhin. Beyond his career as a violinist, Hope has many other talents. As a conductor, he last month began his post as Music Director of the Zurich Chamber Orchestra, replacing Sir Roger Norrington. He is an author, an activist and also has a considerable discography including My Tribute to Yehudi Menuhin; Escape To Paradise - The Hollywood Album (2014); Spheres (2013); Recomposed By Max Richter - Vivaldi: The Four Seasons (2012); and Air- A Baroque Journey (2010). "We are delighted that Daniel Hope has agreed to partner with us during this time of transition," said New Century Executive Director Philip Wilder. 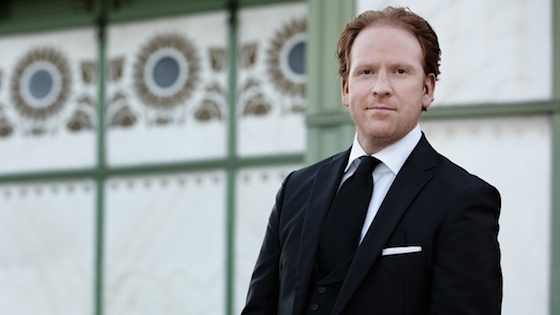 "Daniel’s creativity and experience as a chamber musician, soloist, orchestral leader and music advocate makes him uniquely qualified to guide the New Century Chamber Orchestra into its next chapter." The New Century Chamber Orchestra was founded in 1992 by cellist Miriam Perkoff and violist Wieslaw Pogorzelski and draws its 19 members from the San Francisco Bay Area and across the United States and Europe.